As Gemma Davison prepares for a second return to her old club in a month, with Reading taking on Chelsea Women in the Conti Cup on Wednesday night, her affection for the Blues fans is clear, writes Jane Grove. “Do you know what, it’s nice to be back because I love the fans, and the reception I got was really, really nice; it’s something that will stay with me forever,” she said after the Royals’ 1-0 defeat by Chelsea Women early in December, thanks to a Ji So-Yun goal early in the second half. 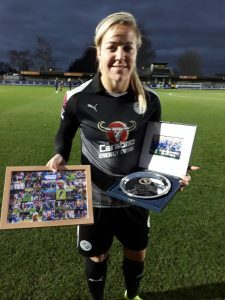 Blues fans made a presentation to Gemma before the game, in recognition of the four years she spent at the club, with a silver plate and framed photo montage now taking pride of place in her flat. “It was really nice; I appreciated it. It was very nice of them; I’m really thankful for that,” she said. The well-travelled player, who began as a 14-year-old with Arsenal Ladies youth team and later had stints playing in the United States before short spells with Arsenal and Liverpool ahead of her Chelsea years, keeps up with her old team-mates at Kingsmeadow. “I keep in touch with everyone here – Karen Carney, Fran Kirby, Hannah [Blundell], Drew [Spence] – everyone really,” said the 31-year-old. “I’ve played with them for quite a while, we’ve made a lot of history together and won some trophies. I’ll never forget those times; those times don’t finish when you leave places… you make friends for life. Now playing some of the best football of her life, Gemma has attracted fresh interest from the England managers, and doesn’t rule out an addition to her 16 caps. “The door’s always open for me to play for England, and if it happens it happens,” she said. Emma Hayes is expected to rotate the squad following Sunday’s 3-0 league victory over Everton. Having such a large squad means there is plenty of scope to bring in fresh legs. Indeed, Chelsea are the only WSL team to use more than 20 different players this season. From the manager’s perspective, Hayes is pleased with the way her girls have avoided overindulging on mince pies over the festive break. “Everyone’s kept themselves in good shape over Christmas; we’ve got competition for places and we’ve got a cup to compete for on Wednesday night,” she said, ahead of the quarter-final.